Ready to get away from it all to enjoy the very best of Costa Rica? Beside ‘zero edge’ pools, this custom luxury travel package also features zero downtimes. How? Your transportation will take you to three secluded areas exclusively by air. Private helicopter flights all within 15 min of your final destination! 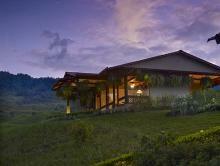 Pacuare Lodge offers a world-renown combination of sustainable luxury, nature, and adventure. 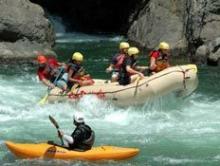 It even includes a world-class whitewater rafting trip you can take when leaving the property. Hacienda Alta Gracia is a unique step in your travel package. Enjoy the sumptuous lodging while exploring Costa Rica’s rural heritage and its modern equestrian luxury. Visit the local coffee plantation, the town market, or take ultralight flights for amazing views and extra adventure. The views get even better after your short helicopter ride to Kura Design Villas. Here you’ll have an unparalleled luxury experience in an intimate, adult-only environment. The breathtaking panoramic views provide the perfect backdrop to help you forget about your smartphone. Unless you’re using it to take amazing photos or underwater selfies from one of the best infinity pools in the country. In each of these properties you can add a complimentary night for select dates. 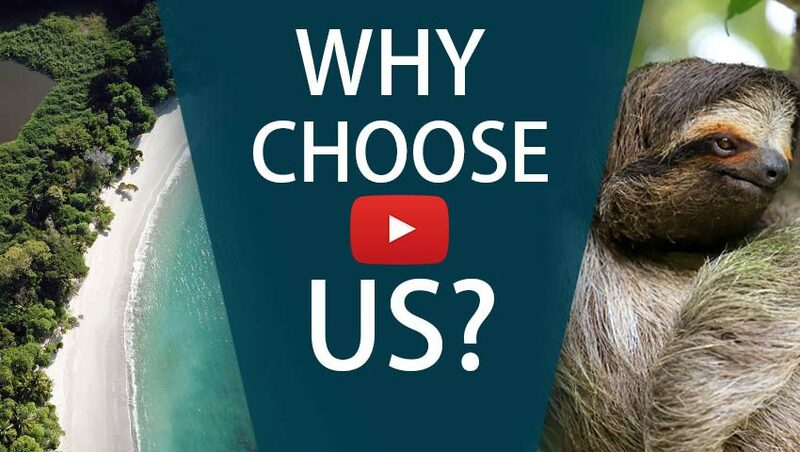 Just ask your travel consultant for details. What’s included in ‘Infinity Pools… and Beyond!’ vacation? Your arrival is smooth and easy, as we greet you off the plane and help through the customs line. Enjoy a short private helicopter ride to stunning Pacuare Lodge. 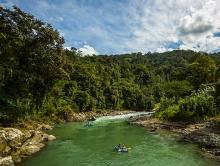 In minutes you’ll be in the heart of the jungle relaxing and away from it all. In the afternoon, if you feel ready to test your limits, sign up for Canyoning – Tesorito Creek Experience, an outdoor adventure that includes rock climbing, a descent down a small waterfall, sliding along cables, swinging through the jungle like Tarzan, and rappelling down a 30-meter (100-foot) rock face. Relax today or add activities to fit your interests from the amazing available options. We recommend doing the Ancient Trail & Hidden Waterfall Hike, and Pacuare Canopy Adventure. After the adrenaline-filled day, enjoy a private romantic dinner riverside with a bonfire and candlelight. Early risers can enjoy a bird watching tour in the morning before hopping on a raft. The ultimate Pacuare experience—white water rafting class-III and IV rapids through rugged canyons and verdant rainforest surroundings, out of the lodge. 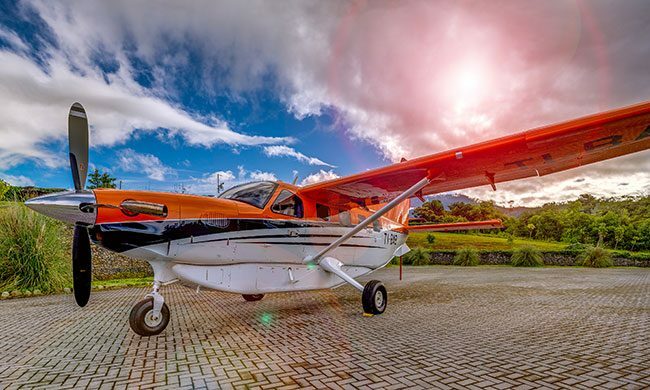 Once you reach Siquirres, your private helicopter will have you in Costa Rica’s southern zone in no time. Here you’ll enjoy the luxurious accommodations and amazing setting amid coffee plantations and with modern equestrian luxury. Enjoy an (optional) horseback ride to El Cedral Coffee plantation where your guide will explain the details of coffee production. Boruka or Bruncas are indigenous people of Costa Rica. Their most famous tradition is minutiously painted ‘devil’ masks made of the balsa wood, featuring intricate designs of nature and wildlife. Spend the day in the remote Boruca village with your guide; hear their stories, eat their food, listen to their music and dance to the beat of their hand-made drums as learn why they strive to keep their cultural traditions and language alive. Support them by purchasing their exquisite crafts! Your private helicopter will whisk you to the coast to enjoy your stay at Kura Design Villas. Built on an impressive mountain ridge with tropical, minimalist architecture, it’s a perfect setting for a luxurious romantic vacation experience along with breathtaking Pacific Ocean views. This tour takes you on an early morning boat ride for a full day of fun to Caño Island Biological Reserve and a visit to Violines Island. The boat ride is part of the adventure: the 1.5-hour trip is a great opportunity for dolphin and whale watching, as you see spotted and bottlenose dolphins, humpback whales (depending on the season), large sea turtles, and even flying fish. Enjoy a day relaxing by the pool and enjoying some downtime. 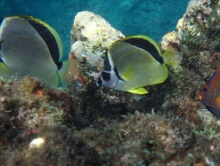 Enjoy a full day trip from Uvita to the one of the best spots for snorkeling in Costa Rica.